Moana is a phinisi schooner made with ironwood. She combines facilities of a modern vessel with traditional style. Moana offers to visit one of the most well-known destinations of Indonesia - Komodo Island. Moana can accommodate 10 passengers in 5 cabins. Boat got refurbished in 2015 with all 5 cabins being redesigned, bathrooms en suite and since 2016 she got a new lounge. All rooms are located on the lower deck. One cabin style has a double bed and one cabin style with a twin bunk style beds. There is also a Family cabin with one large double bed giving space for two adults and one toddler. All Moana’s cabins have private facilities and air conditioning. After the diving passengers of Moana can spend time in spacious and comfortable indoor salon. There are also plenty of open air spaces for relaxing. Meals can be served on the big dining table on the upper deck. This area is great to enjoy gorgeous marine view under sails. Dive deck located on the stern of the boat. It is comfortable for preparation for the dive. There is 12 ltr tank here. Equipment items can be rented on board. Moana has 2 speedboats to get divers to the remote dive sites. There are all safety equipment on board of Moana Liveaboard. There are emergency rafts, life vests, first aid kit. Main Moana itinerary includes dive sites of Komodo National Park. This destination is extraordinary. It’s a home for numerous of creatures. Reef sharks can be spotted as well as tuna, and schools of barracudas. Komodo also is known for a diversity of underwater landscaped. You can dive along the coral walls or in spectacular drop-offs. Komodo National Park can offer macro diving as well. Pygmy horses and nudibranchs can be seen in colorful coral gardens. 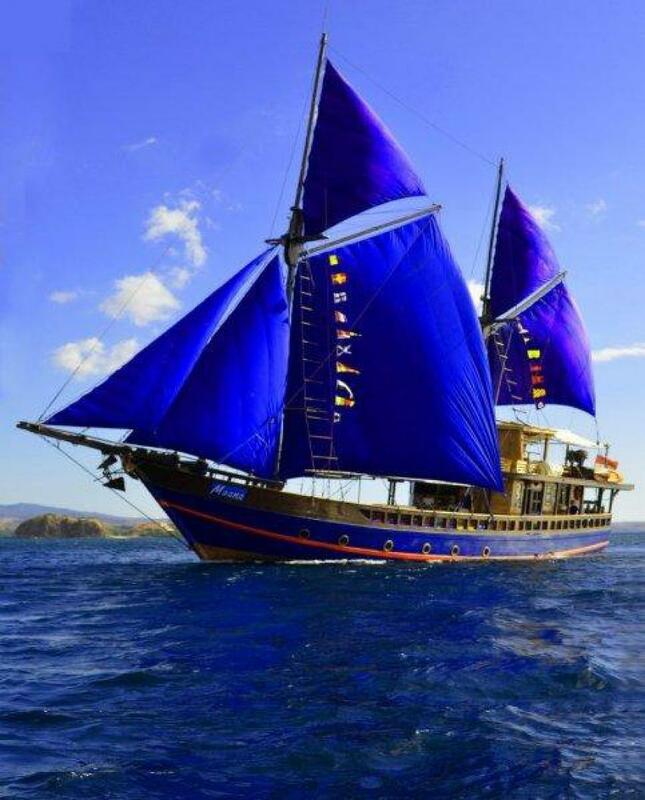 Moana liveaboard offers not only diving at Komodo, you can explore Rinca Island and meet its famous inhabitants Large Komodo Lizards.